This is a truly important article the international media and mainstream historians dictating how we think, do not want you to read. So we can bring you more TRUTH, please be sure to subscribe to our FREE newsletter at the top right hand corner of this page before leaving us today. I met with my liberal sister over the Christmas holiday and was appalled by her lack of knowledge, and ignorance when it came to South African history. Seems she’d been schooled by the international media well. Because “blacks were in South Africa first, and screwed out of their land by white devils”- which is abject rubbish as the following article will demonstrate, it’s apparently justifiable for them to essentially kill off the non-black population. It didn’t seem to matter that British and Afrikaner settlers built the nation, or that most of victims of black atrocity were themselves black/have some black ancestry…. It also didn’t seem to matter that the US, where my sister hails from, itself was a British settler colony where the natives were displaced so colonisers could enrich themselves. Wonder if my sis would be alright with the US’s native population rising up and chopping her and her family up while they sun themselves on a California beach-as so often happens in SA. Let it be known – blacks ONLY moved into southern Africa in huge numbers once the European settlers and their Asian indentured labourers developed it. by EKP friend, Brendi R.
The recent uproar in South Africa over the claims by ANC president Jacob Zuma that the 1913 Land Act dispossessed blacks is a blatant lie, and forms part of four core lies about South African history, a New Observer correspondent Yochanan has written. 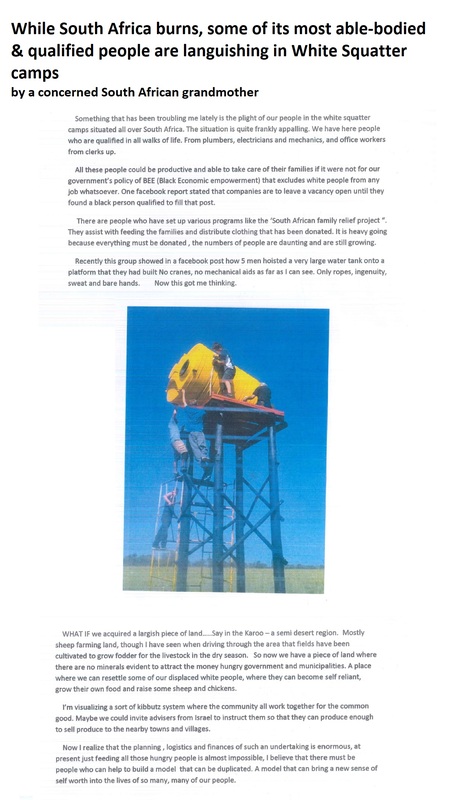 LIE NUMBER ONE: There is a common belief in South Africa that the Natives Land Act of 1913 shoved blacks on reserves (‘7 percent of the land’) and ‘prohibited them from buying land in white areas’. That ‘whites forcibly removed blacks to these reserves and that these reserves were on the worst land in the country with no mineral riches and that whites kept all the best land and minerals for themselves’. Now if I was a black man, I would probably also want to believe that myth, because it would ensure me eternal victimhood status and compensation for generations to come. Unfortunately, it is a blatant lie and can be attributed to the lack of reading ability or legal comprehension of the journalists and historians of our time. Black tribal areas, secured, not defined, by the 1913 Land Act. THE TRUTH: First of all the biggest Platinum reserves in the world run through the former Black homeland of Bophuthatswana (North West province). The former Nationalist government had no problem allocating this area to the Tswana tribes for self-rule—although they already had a massive country called Botswana given to them by the British. It was originally part of South Africa, called Bechuanaland. Blacks further got another two massive countries from the British called Lesotho and Swaziland. There goes their 7 percent. LIE NUMBER TWO: ‘Black homelands were on the worst land in South Africa’. THE TRUTH: When one compares the rainfall map of South Africa and anybody with elementary knowledge of South Africa will tell you that the largest part of South Africa is called the Karoo. It is a semi desert comparable to Arizona or Nevada in the USA. Blacks never even entered this area let alone settled it. Whites made it blossom and created successful sheep farms producing meat of world quality. Black “settlements” are found on the north and east coast of South Africa. The East Coast has a sub-tropical climate and the north a prairie-like climate with summer rainfall and thunderstorms. An exception to this is the Western Cape with a Mediterranean climate and winter rainfall. The northern and eastern part of South Africa with its beautiful green grasslands and fertile soil is where the blacks eventually coalesced and this is the land they chose for themselves. Their eventual homelands were found on the land they inhabited out of their own free will. The Afrikaners even have a song praising the greenness of Natal, called “Groen is die land van Natal” (Green is the land of Natal). It was perfect grazing area for the cattle herding blacks. LIE NUMBER THREE: ‘Blacks are indigenous to South Africa and first settled it’. THE TRUTH: Today Blacks in South Africa often tell Afrikaners and other minorities such as the Coloureds, Indians, Chinese or Jews to adapt to their misrule and corruption or “Go Home”…implying that we, who have been born here, who hold legal citizenship through successive birthrights; should emigrate to Europe, Malaysia, India or Israel. That the only ones who have a legal claim to South Africa, all of it, are the blacks. Blacks believe that they are ‘indigenous to South Africa’—but they are not: it was proven by DNA research. We are ALL settlers in South Africa. All South Africans are settlers, regardless of their skin colour, and their DNA carries the proof. So says Dr Wilmot James, head of the African Genome Project, a distinguished academic, sociologist and, more recently, honorary professor of human genetics at the University of Cape Town. Where is the archaeological proof that blacks ‘settled’ South Africa? Apart from a few scattered archaeological remains found of black culture in the far northern Transvaal prior to 1652, it is generally agreed that blacks and whites were contemporary settlers of South Africa. I use the term “Settler” loosely, because blacks never ‘settled’ South Africa; their presence was nomadic. Blacks were itinerants who travelled from place to place with no fixed home. Whole capital “cities” of grass huts could be moved if grazing was exhausted. They had no demarcated areas, no fences, no borders, no maps, no title deeds to proof ownership of any land apart from a verbal claim and mutual understanding that their temporary presence in a certain area in a certain period of time constituted “ownership” of the land. They left behind no foundations of buildings, no statues, no roads, no rock paintings, not a single proof of “settlement” of the land prior to the whites settling South Africa. The only rock paintings were made by the Bushmen and the Hottentots (Khoi-Khoi and San) in the caves they temporarily occupied. Blacks were pastoral-nomads and the Bushmen/Hottentots were hunter-gatherer-nomads. Whites, on the other hand, built cities, railroads, dams and a first world country comparable to the best in Europe and the new world…their legacy speaks of a people who intended to live there for a thousand years, if not eternity. To claim that ‘the whole of Africa belongs to Blacks’ is absurd. It is like an Italian claiming the whole of Europe belongs to Italians, including Norway. In fact, the pyramids of Egypt are proof of white settlement going back thousands of years—and also the Phoenicians settling Carthage and the Greeks settling Alexandria. The white settlers of the Cape first came face to face with the Bantu around 1770 on the banks of the Great Fish River, 120 years after Van Riebeeck came to the Cape and 1000 km east of Cape Town. LIE NUMBER FOUR: Whites created black reserves and homelands. THE TRUTH: Blacks created the homelands themselves, thanks to Shaka Zulu. The common belief is that the ‘black tribes at the time were all living peacefully and in the spirit of ‘Ubuntu’ with each other in a virtual liberal paradise’. Nothing could be further from the truth. Shaka-Zulu was a genocidal maniac who wiped out some two million black people in the Defeqane ( “great scattering”). Above: The Difeqane, or “great scattering” of blacks occurred centuries after Europeans arrived in South Africa. The Zulu tyrant Shaka, at the time was committing genocide against other tribes. The Swazis and the Ndebeles fled back north in the direction of central Africa where they migrated from. The Sothos fled into the mountains of what is today, Lesotho. The rest of the smaller tribes huddled together trying to find strength in coalescing. That is the history of black South Africans that blacks prefer to ignore… that blacks drove other blacks off their land, not whites. It is into this maelstrom of black chaos that the Boers trekked in 1838. As far as they went they found large open sections of country uninhabited by anyone. Black tribes fleeing Shaka’s carnage grouped themselves into areas finding protection in concentrated numbers. This is how Sir Theophilus Shepstone later found the remnants of black refugees huddled together on self-created reserves. He just demarcated it in order to protect them from each other. The creators of the Bantustans were not the Boers or the whites, it was a black man called Shaka. Again, if you enjoyed this story and appreciate TRUTH, please sign up for our FREE monthly newsletter. 900,000 visits this past 6 months has to tell you something!